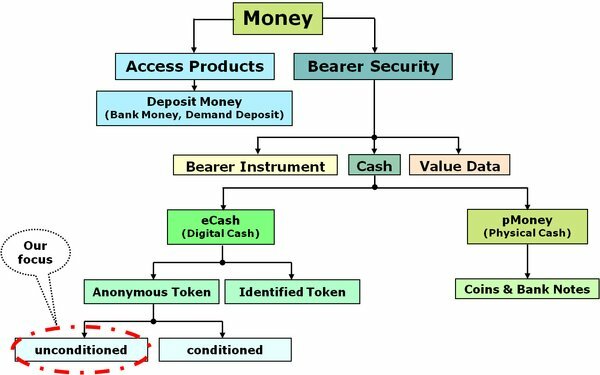 Money in the form of Physical Cash (token money) implies a type of security based on physical presence. It is a bearer instrument which can be used spontaneously and instantaneously to make payments (transfers of monetary value) from person to person without the involvement of an intermediate (e.g. a bank). This also holds true for another phenotype of money: Digital Cash. It stretches a financial rotation system, where serialized and authenticated bit objects named eCoins are circulating on their travel through the economy. But what is Digital Cash exactly? Unluckily, many of the schemes the popular press often refers to as Digital Cash are not describing CASH! A system providing only little more than a new commercial transaction mechanisms adding secure transmission capability for credit card numbers over the Internet is not much of a financial innovation in relation to Digital Cash. Most examples of electronic banking do not involve a different form of money, but instead simply represent a different way in accessing traditional financial (banking) services, extending the supply chain. Electronic Money, Cash or eMoney These are generic definitions for all meanings of payment in the digital space. Physical Money, pMoney or pCash They mean always physical coins and physical bills acting as legal tender. Digital Cash or eCash These terms are the closest modification of eMoney to mimic the behavior of physical money. The presented fairCASH system falls in this category. It is NOT legal tender, namely, money issued by the state and designated as lawful for the payment of taxes and other debts, but technical it could be. In such a case we are then talking about eCurrency. The name based on an idea recorded in the mind of an ICT component. It represents an obligation of a private company rather than the central bank or treasury. Electronic Currency or eCurrency They always mean eCoins and eBills acting as legal tender legalized by a central bank, comparable like specie or serving as a digital banknote. Up to today, such a surrogate of pMoney is only a theoretical fiction and do not exist in any country. The only thing to make this happen is to adapt a Digital Cash scheme officially by a central bank, so that digital token goes hand-in-hand with physical cash, both central bank-issued token. The presented fairCASH system is a perfect candidate as a technical base for such an eCurrency implementation. eCoins can be securely transferred to others in a direct (P2P) manner. Essentially, Digital Cash bases on payment messages bearing digital signatures. In order that Digital Cash has value, it is sufficient that it is exchangeable against ordinary cash, deposit money or for some good or service. Unconditional anonymous Digital Cash should be defined untraceable, and transactions made with it should be unlinkable. The definition of untraceability means that a withdrawal cannot be associated with its subsequent deposits, while unlinkability means that it is impossible to associate two different Digital Cash transactions made by the same person with each other. It is this potential aspect of anonymity that gives Digital Cash its significance and not the fact that it is electronic because almost all monetary transactions are already digital, as has been the case for years. Digital Cash addresses not the trillions of €uros handled each day by financial institutions or government clearinghouses. The final mile of value exchange inter­actions is the point where Digital Cash becomes an interesting target. Electronic money – as defined by European Commission – is a digital equivalent of cash, stored e.g. on an electronic device. One common type of eMoney is the 'electronic purse', where users store amounts of money on their eWallet. The eMoney Directive (2009/110/EC) (EMD) focuses on modernizing EU rules on electronic money, especially bringing the prudential regime for ELectronic Money Institutions (ELMIs) into line with the requirements for pay­ment institutions in the Payment Services Directive (PSD). The rules in the eMoney Directive were brought into force (effected and transpositioned) in all EU countries by 30. April 2011. Unfortunately the EMD is more account/coupon oriented (missing transferability) and less true Digital Cash positioned, so we have to compile a more and better fitting definition for fairCASH. A monetary, pre-paid, digital and intrinsic eCash mobile payment instrument able to substitute physical cash using electronic and exchangeable units of value, called eCoins, stored in a physically and cryptographically protected and secured tamper-protected sealed eWallet container (nano-safe). It can be deployed on any communication platform in the virtual and physical world. This value transfer Digital Cash system contains direct inter-object payments between contracting parties such as institutions, corporations, or persons, other than the electronic money issuer without the participation of a third party. These conditions create a P2P capable eToken system with circulating objects and transferability capability. eCoins are issued as encrypted ICT data objects in direct or indirect exchange for (other) monetary value. The aggregated value must not be lower than the issued monetary value. Transactions are conducted without the use of accounts, but by the exchange of eMoney bearer securities as a bond. This means outstanding debits have to be exchanged with the eCash issuer.